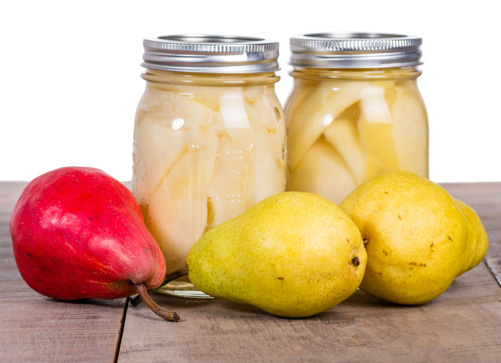 Quantity: For each 7-quart canner load, you need an average of 17-1/2 pounds of fresh pears. For each 9-pint canner load, you need an average of 11 pounds of fresh pears. Quality: Choose ripe, mature fruit of ideal quality for eating fresh or cooking. 2. Wash and peel pears. Cut lengthwise in halves and remove core. A melon baller or metal measuring spoon works well for coring pears. 3. To prevent darkening, hold pears in a mixture of water and ascorbic acid (use directions at beginning). 4. Prepare a very light, light or medium syrup, or pack pears in apple juice, white grape juice or water. Raw packs make poor quality pears. 5. Boil drained pears five minutes in syrup, juice or water. 6. Fill jars with hot fruit and cooking liquid; leave 1/2-inch headspace. 7. Remove air bubbles and adjust headspace if needed. Wipe rims of jars with a dampened clean paper towel; apply two-piece metal canning lids. 8. Process in a boiling water canner or pressure canner according to the recommendations. Let cool, undisturbed, 12-24 hours and check for seals. Process Times for Pears, halved in a Dial-Gauge Pressure Canner. Process Times for Halved Pears in a Weighted-Gauge Pressure Canner.